Experience has suggested that academic scientists can be as ‘guilty’ as the popular press in generating a ‘moral panic’ causing mass anxiety and hysteria. Take for example the media reporting of the new variant Creuztfeld-Jacob disease, a very rare yet important cause of dementia (Fitzpatrick, 1996). How dementia is represented in the media is a good surrogate market of how the issue can be represented in certain segments of the culture of a society (Zeilig, 2014). According to George, Whitehouse and Ballenger (2011), the concept of dementia, a term which they attribute to Celsus in the first century A.D. — has long carried “social implications for those so diagnosed and has been associated with reduced civilian and legal competence, as well as with entitlement to support and protection. A range of emotionally charged metaphors about dementia pervades the popular imagination, and these are found in newspaper accounts, political speeches, and in both documentary and feature films. The ‘G8 dementia’ summit allowed many of these recurrent motifs to resurface unchallenged. I’ve been intrigued how the G8 Dementia Summit was covered in the English-speaking media on the web. So I did a Google search for “G8 dementia”, on the UK Google site. It only came up with languages in English article, and I included the top 75 search results. I excluded some search results. I excluded webpages consisting of only videos. Flickr photos or Pinterest boards. I decided to exclude articles less than 100 words long. 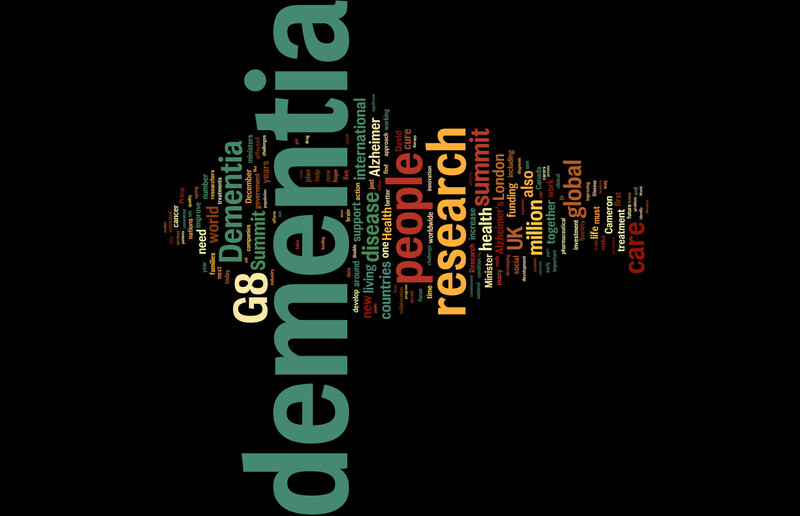 The aim of this piece of work was to complete a preliminary exploration of how the #G8dementia summit was reported on the internet in the English language. The literature in this field is very small, and no study to my knowledge has ever been undertaken for the actual reporting of the G8 dementia summit which was unprecedented. For the text analysis, done online using this tool, I excluded the author names, titles, location of authorship of the article (e.g. London). also excluded the endings, invariably, “Read more” “You may also like”, “You can read more about” and list of other ‘links’ to look at. I excluded duplicates. Finally, one article which was largely a compilation of tweets was excluded. 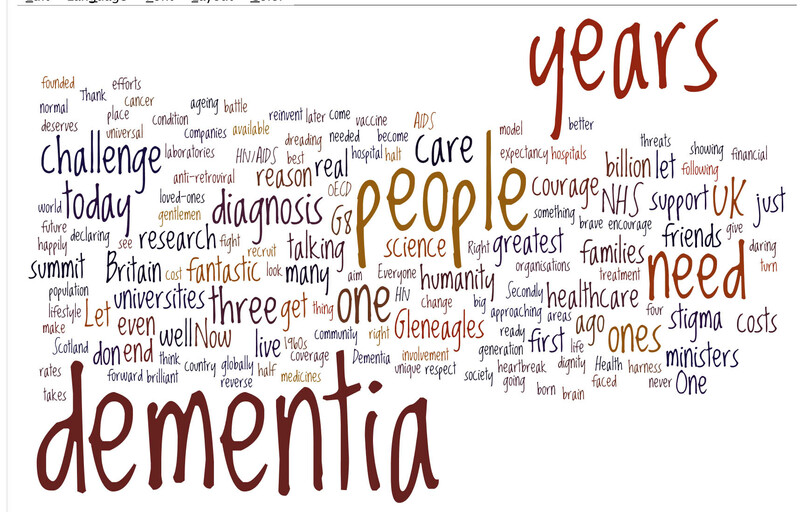 Unsurprisingly, the word “dementia” featured 955 times, but encouragingly “people” featured 280 times. I found this quite gratifying as I have just published a book on the rôle of the person and the environment for living well with dementia – though the vast majority of articles did not have wellbeing as their main thrust. I think the problem in English policy is revealed in the finding that “research” appears 334 times, and yet “wellbeing” is there fewer than eight times. The facts that “data” is used thirty times, with “collaboration” 28 times, hint at the overall drive towards data sharing for the development of cross-country trials and personalised medicine. There seems to be a greater need for “funding” somewhere, a word used 66 times. There’s clearly an “international” focus, a word used 103 times. The word “carers” was only used thirty times – a bit of a knee in the groin for the caring community? The term “social care” is used 14 times across the 75 articles, but this is dwarfed by the use of the term “innovation” used 37 times. “Innovation” is of course a key meme of Big Pharma, as demonstrated by this infographic by Eli Lilly, a prominent company in dementia neuropharmacology. The ideological bias towards the medical model for dementia is reflected in the frequency of the word “disease” or “diseases”, totalling 203; “treatment” or “treatments”, totalling 91; and “cure” or “cures”, totalling 72. There’s clearly a bias towards Alzheimer’s disease, in that “Alzheimer” was used 145 times, with the word “vascular” used only six times. Strikingly, no other forms of dementia were mentioned. There are probably about a hundred known forms of diagnoses comprising the dementias, including some very common ones such as “frontotemporal” or “diffuse Lewy Body”. Various authors, including Kate Swaffer who lives with a dementia herself, have often remarked on this bias known in the literature as “Alzheimerisation” (Swaffer, 2012). “Cameron” is mentioned 60 times, and “Hunt” is mentioned 24 times. “Hughes”, as in Jeremy Hughes, CEO of the Alzheimer’s Society, is only mentioned 5 times. It’s also interesting to see which other conditions are mentioned alongside dementia in these 75 articles. Only three were, in fact: these are “cancer” (45 times), HIV (25 times) and AIDS (29 times); treating HIV and AIDS as distinct, which is of course is not necessary to do, and there may have been no intention on the part of the journalists to use these words specifically in their narratives. Thankfully, the usual dramatic terms were not used often. “It also called on the World Health Organization to identify dementia as “an increasing threat to global health” and to help countries adapt to the dementia timebomb. The terms “bomb” or “bombs” were only used four times, and encouraging one of these was complaining about in a passage complaining about military metaphors. The danger of flooding has long been associated with dementia. A 1982 U.K. report was entitled: “The rising tide: Developing services for mental illness in old age” (Arie and Jolley, 1983). Note Hunt’s ‘wordie’ contains ‘heartache’, ‘threats’, ‘battle’, ‘dreading’, ‘stigma’ and ‘fight’, but also includes ‘diagnosis’, ‘people’ and ‘research’. 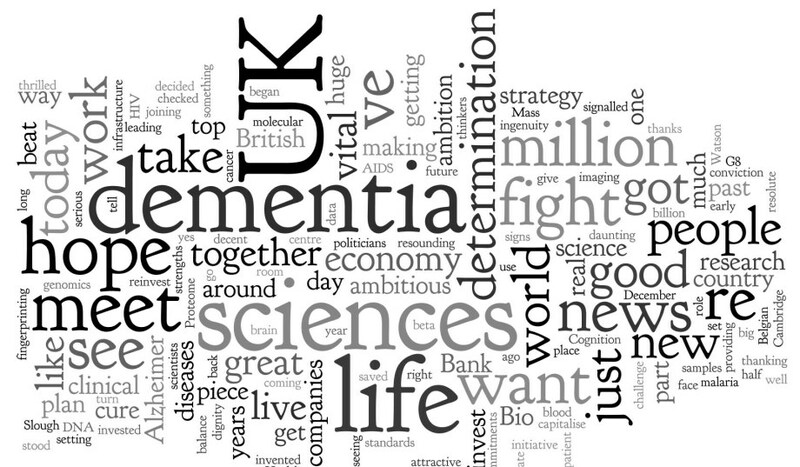 It is indeed fascinating the on-running theme of promoting dementia research in the absence of a context of wellbeing. David Cameron’s ‘Wordie’ is quite tame. But the consequences for this media messaging are potentially quite profound. There is a sample bias introduced with how Google orders its ranking. Page ranking is not only calculated on the basis of traffic, but also in terms of degree of linkage with other websites. It is possible that higher ranking articles, particularly online versions of newspaper articles, have a common root such as the Press Association, leading to a lack of independence amongst authors in their coverage of the Summit. Encouragingly though the frequency of words such as ‘timebomb’ and ‘flood’ were not as much as one might have feared, from the (albeit small) literature in this field. If you assume that the 75 articles form a representative cohort of copy on the G8 dementia summit, the picture presented has a clear emphasis on a magic pharmacological bullet for dementia. The copy represents not a balanced debate, on behalf of all stakeholders, but reads like a business case to invest more in neuropharmacological-based research into dementia. Arie, T., & Jolley, D. (1983). The rising tide. British Medical Journal, 286, 325–326. Fitzpatrick, M. (1996) Creutzfeldt-Jakob disease and bovine spongiform encephalopathy, BMJ, 312, 1037.3. George, D.R., Whitehouse, P.J., Ballenger, J. (2011) The evolving classification of dementia: placing the DSM-V in a meaningful historical and cultural context and pondering the future of “Alzheimer’s”, Cult Med Psychiatry. 2011 Sep;35(3):417-35. Swaffer, K. (2012) Dementia, denial, old age and dying, blogpost here. Whitehouse, P.J. (2014) The end of Alzheimer’s disease-From biochemical pharmacology to ecopsychosociology: A personal perspective. Biochem Pharmacol. 2014 Apr 15;88(4):677-681. doi: 10.1016/j.bcp.2013.11.017. Zeilig H. (2014) Dementia as a cultural metaphor, Gerontologist, 54(2), pp. 258-67.